Home › Articles › Columns › Tales from the Crip › Tales From The Crip: "The Paper Mirror: Drawing Alison Bechdel"
Renowned visual artist and educator Riva Lehrer has teamed up with brilliant cartoonist and graphic memoirist, Alison Bechdel in the new short film, “The Paper Mirror: Drawing Alison Bechdel.” Lehrer, a Chicago-based disabled artist famous for her stunning portraits of disabled luminaries such as Nomy Lamm, Bill “Crutchmaster” Shannon and Neil Marcus spent two years creating an equally captivating portrait of Bechdel. This process was thankfully chronicled by filmmaker Charissa King-O’Brien. The Paper Mirror documents the collaborative efforts between these fascinating women, capturing an intimate point of transition for Bechdel as she’s facing a radical turning point in her career. Celebrated for her Dykes To Watch Out For comics (which originated the simple yet genius “Bechdel Test” for identifying gender bias in movies), and the haunting yet humorous graphic memoir “Fun Home,” Bechdel yearned to diversify her subject matter yet struggled with completing the follow up to her acclaimed tragicomic. 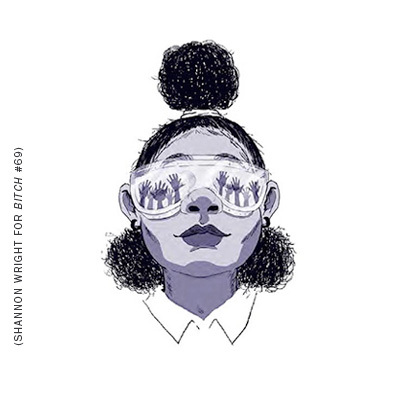 The Paper Mirror provides a glimpse into the life of an artist at a crossroads, and examines complex issues pertinent to both women like queer culture, beauty and disability. Lehrer’s artwork is noted for its exploration of corporeal themes and is deeply informed by the richness of disability culture; Bechdel has well-documented Obsessive Compulsive Disorder, which influences her meticulous drawing practices. The Paper Mirror is currently screening at several film festivals, and has a scheduled release date for this summer. If you can’t make it to any screenings and need a Bechdel fix, you can purchase her latest graphic memoir, Are You My Mother? here. To view more of Riva Lehrer’s incredible paintings and drawings, visit her website. 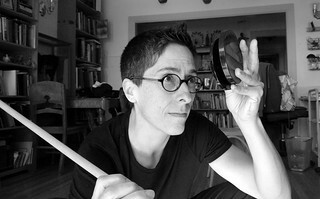 Photo of Alison Bechdel by Riva Lehrer. I am thrilled to learn about this! Alison Bechdel and her work has been really important to my life, and my own personal growth and development in learning more about me and my relationship with my mother. Can't wait to see it. Hey Riva: Congratulations! I hope I get an opportunity to see this! I was nervous to come out to my parents, but I was infuriated by pundits who kept saying Islam and LGBT identity are at odds.